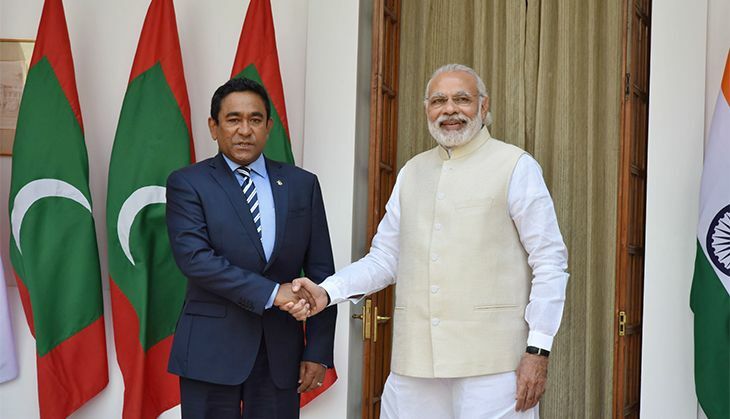 Home » international news » Maldives President's visit: why is India hell-bent on helping a dictator? Maldives President Yameen is in Delhi for a two-day visit. Why is India keen on helping a dictator? India's relations with Maldives and its President, Abdulla Yameen, have remained problematic since the arrest and imprisonment of former President Mohamed Nasheed in February 2015. This led to cancellation of Prime Minister Narendra Modi's scheduled visit in March 2015. Strangely enough, Yameen's visit to Delhi on 10 and 11 April comes at a time when there is hardly any sign of a thaw. Yameen's style of functioning has earned him huge opposition within the country and abroad, particularly in the US and the Commonwealth. His election to the top post in November 2013 was mired in controversy, with a partisan judiciary seen to be thwarting a popular mandate. Within a year of coming to power, Yameen got the People's Majlis (the national legislature) to impeach two judges of the Supreme Court - those who did not support the repeated postponement of the presidential elections. He also sacked the Assistant Attorney-General, Ismail Wisham, for exposing the disproportionate assets of tourism minister Ahmed Adeeb, and defence minister Moosa Ali Jaleel for 'plotting a coup'. Then Yameen went about systematically clipping the wings of his main rivals. Nasheed was detained under 'terrorism' charges and sentenced to 13 years' imprisonment. Another important rival, Qasim Ibrahim, was targeted through his business interests. He was hit with a $100 million fine for delays in developing the islands that were leased out to him. His bank accounts were frozen, disabling him from paying salaries to thousands of his employees. Qasim was forced to make a deal with Adeeb, who was later elevated to the post of Vice-President. Adeeb was regarded as the President's closest confidant, but was later implicated in an assassination attempt on Yameen, and was impeached in November 2015. His whereabouts are not known. Yameen wanted unchallenged power within the country, and sought new geopolitical equations outside. But there was one major hitch - the required legislation could not be passed without the support of the Maldivian Democratic Party (MDP), the main Opposition group in the Majlis, led by Nasheed. So, Yameen struck a deal with the MDP. They would support him in passing a few critical pieces of legislation, such as limiting the age of Presidential candidates (to block Qasim's future ambitions); leasing out islands to foreigners (read: the Chinese). In turn, he would commute Nasheed's prison sentence to house arrest. Further, he promised talks with the Opposition parties to end their three-month long protests. The MDP agreed in good faith and passed the legislation, and Nasheed was shifted home on 19 July 2015. But barely a month later, Yameen reneged on his promise. Nasheed was sent back to prison with no hope of appeal, nor of remission. In September 2014, Yameen hosted the first ever visit by a Chinese Head of State, President Xi Jinping, who invited Maldives to join the Maritime Silk Route. Yameen signed a MoU with Xi, awarding the Integrated Development Project of Ihavandhippolu or Ihavan in the northern most atoll of Maldives. The strategic significance of the island lies in the fact that it is the closest point to India, and that it lies on the 'seven-degree channel' that connects the main east-west shipping routes of China and South-East Asia to the oil producing nations of the Persian Gulf. Then in June 2015, Adeeb announced that Maldives would borrow $400 million from China Exim Bank to develop the runway and expansion of the Ibrahim Nasir International Airport in Male'. The contract was originally awarded to an Indian company, GMR Group, but was terminated soon after the coup in 2012 that overthrew Nasheed. Last week, on 6 April, President Yameen inaugurated the expansion project of the airport - awarding the contract to the Beijing Urban Construction Group. In January 2016, Yameen, under pressure from the Commonwealth Ministerial Action Group that includes India, permitted Nasheed to travel to London for spinal surgery. The latter has sought further extension of his leave from prison. While Nasheed's case gets international focus due to his high-profile lawyer Amal Clooney, his political future remains uncertain. It is clear from President Yameen's speech at Hyderabad House on 11 April that he was in Delhi to offer his sincere 'thanks' and 'appreciation for the very steadfast way India has protected the Maldives from the Commonwealth Ministerial Action Group'. So now we know who has been preventing the US and the UK from taking tough action against this dictator, who has suppressed all civil liberties, arrested several journalists, ordered raids on a TV station that showed some 'independence' and humbled and humiliated his main opposition leaders, either through the judiciary or through arbitrary executive orders. And to think that the Modi government came to power on the promise of a 'muscular' foreign policy. The current political machinations with our neighbours, be it with Pakistan or Maldives, seem bizarre. 'Sab ka saath, sab ka vikas' actually has a new meaning. It does not matter if your neighbour is not with you, but with China, you will still work towards its progress. Our policy-makers fail to understand that Maldives does not want your 'saath'. Yameen is certainly no friend of India and will never be. To strengthen him is to weaken all the democratic forces in the Maldives. President Yameen is apparently set to ink a 'Counter-Terrorism' agreement, among others, with India. It was under the 'Prevention of Terrorism Act' that Yameen had got Nasheed arrested. Knowing this, it would be foolhardy to strengthen Yameen's hands, since under such an agreement, India would be treaty-bound to hand over any Maldivian residing in India, who is charged with terrorism by the government of Maldives. Retired diplomat, presently a Visiting Fellow, Observer Research Foundation.